Your pass includes the 72-hour All Around Town tour with hop-on, hop-off access PLUS either 3, 5, or 7 attractions. View our 40+ top attractions, including museums, cruises, and restaurants, and pick your favorites. Experience all that New York City has to offer with one convenient pass! • Pay one low price - Save 40% or more vs. walk-up ticket prices! • Purchase a 3, 5 or 7 Attraction Pass – then choose as you go from more than 40 of NYCs top sights -- including 9/11 Memorial & Museum, One World Observatory, Statue of Liberty, Top of the Rock, Madame Tussaud's and more! 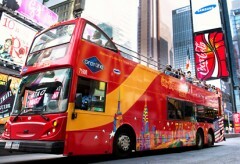 ○ Popular guideded bus tour of New York City’s dazzling lights and landmarks! • Save over 40% vs. walk-up ticket prices! • The only pass that includes All-Around Town Bus Tour featuring the Downtown, Uptown, Brooklyn loops, a Night Tour and the CitySightseeing Ferry! • Choose from 55+ available attractions including Statue of Liberty, Top of the Rock, Madame Tussaud's and more! • Additional options include Go Airlink airport shuttle, for convenient transportation to your airport, and dining discounts. • The ultimate in flexibility: choose the attractions you want to see and get to them easily and conveniently with our Hop-on, Hop-off bus loops. The FreeStyle Pass™ offers all that New York City has to offer on one convenient pass! You’ll have full access to all 3 CitySightseeing hop-on, hop-off bus loops --Uptown, Downtown and Brooklyn. Sit back and enjoy double-decker views as our professional guides point out world-famous landmarks, including Times Square, the Empire State Building, Madison Square Garden, Rockefeller Center, the Brooklyn Bridge, and the Statue of Liberty! Hop off the bus at any of the conveniently located attractions along the tour and use your Freestyle Pass to explore in depth. Spend as much time as you’d like browsing award-winning museums, take in the view from a famous observation deck, stroll in Central Park - the options are almost endless. When you’re ready to move on to the next location, simply hop back on the bus! In addition, don’t miss the chance to take in the New York City skyline from the water! Just hop aboard the CitySightseeing Ferry for a fully narrated harbor cruise with two hop-off locations and unforgettable views of the Manhattan skyline and the Statue of Liberty. This bonus is automatically included with your pass - it doesn’t count as a ‘choice’ -- and you can connect to and from the ferry from the Downtown Bus loop. Whether you choose a 3-attraction pass, 5-attraction pass or 7-attraction pass, we know you’ll love the ease and convenience of the FreeStyle Pass ™ New York. *Please note: You may visit each individual attraction only once with your pass. • The TOUR - Click here for reservation instructions. Tour lengths vary based on the route and can range between 90 minutes and 3 hours. Voucher Information: Once you've completed your online purchased, you will be instantly redirected to a page with your live ticket. Just take a screenshot of the QR code and store it in your phone. * This live ticket can be used immediately to board the bus at any designated hop-on stop along the route. No need to travel across town to begin your tour at a specific or less convenient location. Once the driver scans your ticket the first time, your tour is officially underway! Please see the Routes Tab above for a complete list of stops. *You can also print your ticket if you prefer..
*There is no mandatory admission charge for public entry to the Metropolitan Museum of Art, the American Museum of Natural History, The Cloisters, and the Museum of Modern Art. These museums only suggest, but do not mandate an admission donation. For each entrant to any of these museums, Twin America, LLC (d/b/a "CitySightseeing Cruises") makes an agreed upon payment to the museum. 20. Winter Garden Theater - 50th St. & 7th Ave.
43. Winter Garden Theater - 50th St. & 7th Ave. When you start your order, you will be asked to choose the day you believe you will begin using the Freestyle Pass. However, the date you choose is not a firm commitment and you have one year from the date of purchase to use the pass. After one year, it will expire. How do I get my Pass? After you complete your online purchase, you will be redirected to a page with your live Pass. Additionally, an order confirmation with a link to this Pass will be emailed to you within two hours. Simply print or take a picture of the QR code on the pass and you’re ready to either board the bus at any designated stop or gain entry to your selected first attraction. Your Pass is activated the first time it is scanned. How long is my Pass Active? Your FreeStyle Pass is valid for 14-days from the first time it is scanned for entry. The included All Around Town bus ticket is valid for 72 consecutive hours from the first time it is scanned on the bus. This consecutive time-frame includes all bus loops, the Night Tour, CitySightseeing Hop-on, Hop-off Ferry and the bonus museum admission choice included as part of the All Around Town Tour. Do I need to choose which attractions I want to visit now? Nope! You can choose which attractions to see as you go, but please note that some attractions and tours do require reservations. Please refer to the individual attractions or tour websites for more information. Can I visit the same attraction more than once? You may visit each attraction only once. Can I use my Pass to board the bus for the first time? YES! We have recently upgraded our technology, so you no longer have to redeem a voucher for a bus ticket at a visitor’s center. Your live Pass is delivered to you instantly and also serves as your bus ticket. Just print or store it on your phone and the bus driver will scan it for immediate boarding. With unlimited hop-on, hop-off access you can hop off the bus at any of the designated tour stops along the route, spend time walking around or exploring attractions, and get back on the bus at the same stop or any of the other designated stops listed on our map. You can do this an unlimited number of times within the specified hours of the tour. You can only hop off the bus at designated hop-on, hop-off tour stops. Where can I start the bus tour? You can begin the tour at any designated stop along the bus route! The bus driver will simply scan your Pass and you’ll be on your way. 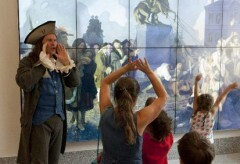 All bus tours feature a live guide providing commentary in English. Recorded commentary is also available in: English, Spanish, French, German, Italian, Hebrew, Portuguese, Mandarin Chinese, Korean and Russian. Tour lengths vary based on the route. We have 4 double-decker bus routes, and you’ll also have access to the CitySightseeing Hop-On, Hop-Off Ferry. The times, listed below, do not include optional time spent off the tour bus at hop-off locations. Please see the “Ticket Includes” tab for specifics on each bus tour. • Save over 40% compared to walk-up ticket prices!